Good for the community, good for you. Try our new Volunteering Programme available at EC San Diego and EC Boston! What you can expect from this programme? Students in our Boston and San Diego school are invited each month to a local retirement community to meet older Americans and share stories and conversation about their backgrounds, interests, and cultures. These regular visits allow students enrolled in any course and of any level of English to build relationships with native English speakers, practise their speaking skills, and keep the elderly company! It’s easy to sign up for these visits, students can simply visit the front desk of their school and inform the staff they are interested in going to volunteer at the retirement community. Trips are organized once per month and students will be notified of upcoming opportunities to volunteer through our weekly announcements. Each visit lasts approximately one hour. This opportunity is open to students in any of our courses and with any level of English. EC San Diego students volunteer at Casa de Manana, an award-winning retirement home located in the heart of La Jolla, stunning suburb of San Diego. 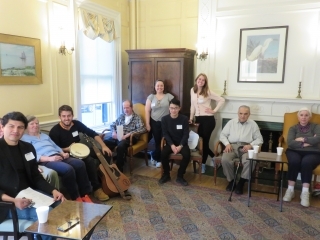 Students studying at EC Boston have the opportunity to volunteer at Hale House, a care-focused community in the centre of Boston. EC Boston also collaborates with another organization called Little Brothers- Friends of the Elderly. Little Brothers- Friends of the Elderly is a non-profit committed to relieving isolation and loneliness among the elderly.